Both White sage and "regular," or Common, sage are a part of the Salvia L. genus of the mint family, classified as Lamiaceae. This genus contains many types of sage in additional to these two, including Clary sage, Lyreleaf sage, Mediterranean sage, Silver sage, Azure Blue sage and Purple sage. Both White and Common sage are ingested and used medicinally. Talk to a health professional before using sage as a medical treatment. Common sage, also known as Salvia officianalis, garden sage and kitchen sage, is used commonly to add flavor in cooking and for medicinal purposes. According to Nerys Purchon, in her book "The Essential Natural Health Bible," Common sage is the type of sage most often used for medicinal purposes. 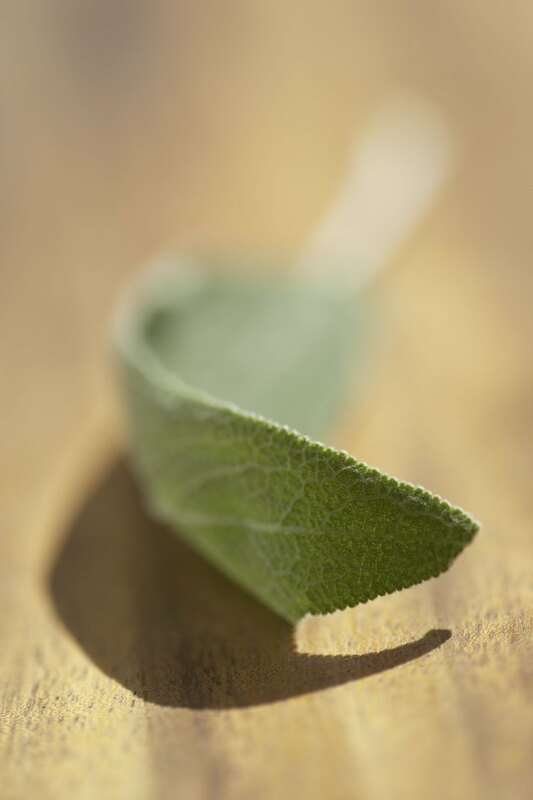 Sage is used for throat and mouth ailments, such as sores and laryngitis. It also is used for skin ailments, such as sores, wounds and abscesses. White sage, or Salvia apiana, seeds were used by Native Americans as food and to heal their eyes. The roots were used after birth for healing. The leaves were used for numerous medicinal purposes, such as a cold remedy or shampoo, to treat sinus problems and to control lactation. The leaves were burned in ceremonies to purify and cleanse. This process was used historically by Native Americans but has become popular in the New Age arena. The sage is burned with the belief that the incense clears away negative thoughts, spirits and dreams as well as illness. Both Common sage and White sage are perennials. They both have grey-green leaves with hairs on them and purple flowers. Taken medicinally, both types of sage come with potential side effects, although sage is safe when used to flavor food. Do not use Common sage if you are pregnant or for long periods of time. The National Center for Complementary and Alternative Medicine explains that the sage family, when taken medicinally, can cause seizures, vertigo, vomiting, kidney damage, a rapid heart rate and other problems if you take too much or take it for too long. It is also possible to be allergic to sage. Talk to a health professional before taking sage. Another plant goes by the same name of White sage. It is found in the sunflower family, and is known as Artemisia ludoviciana. Just like the White sage in the Salvia L. family, this type of White sage, also known as wormwood, white sagebrush, mugwort and other monikers, was in the past and is still burned in rituals to purify and cleanse. This White sage also was used medicinally in tea, salves and other applications for the stomach, sinuses, headaches, sores, eczema and additional ailments. USDA Natural Resources Conservation Service: Classification for Kingdom Plantae Down to Genus Salvia L.